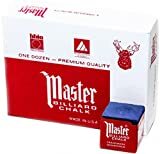 If you own or plan to purchase a new billiards table and/or a pool cue, you will definitely need some pool table cue chalk to ensure the most accurate shots. Pool chalk is an absolute necessity, and applying that pool chalk correctly can greatly enhance your chances of controlling the cue ball. In the following article we have reviewed several of the most popular and best-selling pool table chalk products, and highlighted the pros and cons of each item. We have also included a section on how to use pool table chalk for the best results, as well as a Billiard Cue Stick Chalk Buyers Guide in which we will underscore the various factors you should definitely consider when shopping for these items. A mid-range product that comes two pieces to a box (2 boxes are included), the Longoni Blue Diamond Chalk is a blue-colored chalk that offers incredible moisture retention and allows for less chalking with fewer miscues. 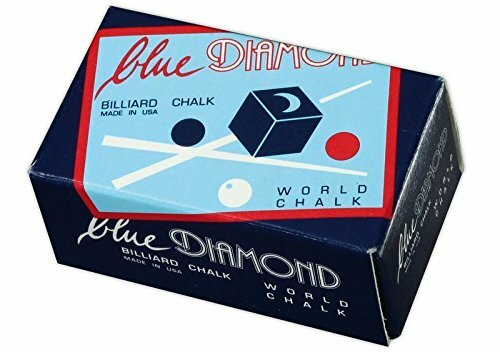 Renowned for its strong grip and enduring performance, the Blue Diamond Chalk from Longoni is not only one of the best-selling chalks for amateurs; it has also been used by top billiard professionals all over the globe for the past 30 years. Those who like to keep their pool table felt—and their cue ball—neat and tidy will love this Longoni Blue Diamond Chalk. Because of its amazing moisture retention, the chalk stays where it belongs—on the pool cue—and those cues require less chalking because of it. Loved by players in the know, we definitely recommend you give this pool chalk a try. Retains moisture. Due to the awesome moisture retention of the Longoni Blue Diamond Chalk, your cues will require less chalking. No mess. Longoni Blue Diamond Chalk adheres to the pool cue very well, which translates to less mess on the felt and your cue ball. Time-Tested. Longoni Blue Diamond Chalk has been used by professional pool players for over 30 years with great results. Fine grains. The fine grains in the Longoni Blue Diamond Chalk can transfer to the hands when chalking. Only 2 Pieces per box. Unlike other chalk products, which often have as many as 5 or 6 pieces of chalk per box, the Longoni Blue Diamond Chalk only comes two to a box. The Kamui .98beta Pool Cue Chalk is the newest formula from the Kamui Company—a company that specializes in fine pool cue chalk. Designed with much finer particles than your standard chalks, this product from Kamui is manufactured to maximize friction between the cue stick and the cue ball. This increased friction leads to a larger “sweet spot” on the cue ball, which generates more spin and greater accuracy, allowing you to leave the cue ball in the perfect position every time. The added friction produced by the Kamui .98beta Pool Cue Chalk helps reduce slipping, which leads to fewer miscues and less deflection. The end result of all of these advantages is a better and much more controlled game. 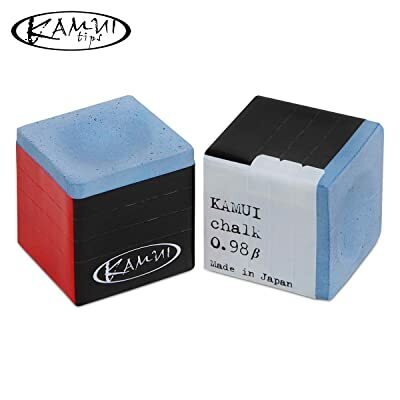 All Kamui products, including this one-of-a-kind chalk, are kept in a climate and humidity controlled environment until the very moment they ship, and because each piece of chalk is individually wrapped you can always be sure you are getting an authentic, original chalk that has never been tampered with or modified. Finer particles. The fine particles on the Kamui .98beta Pool Cue Chalk creates added friction between the cue stick and the cue ball. Fewer miscues. Even though you will need to chalk up less with the Kamui .98beta Pool Cue Chalk, you will still notice fewer miscues. Helps to generate spin. All of the features of the Kamui .98beta Pool Cue Chalk help you generate the maximum amount of spin for better control around the table. Premium priced. Although the Kamui .98beta Pool Cue Chalk is far and away the best chalk on our list of products, it tends to be much pricier than standard pool chalk. Can be dusty. Due to the finer particles in the Kamui .98beta Pool Cue Chalk the product can be a bit dusty. 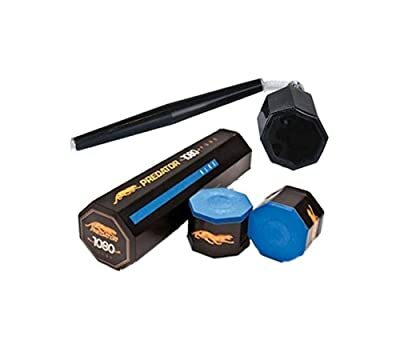 If you’re looking to improve your game with a chalk product that won’t break the bank you should definitely check out the Predator 1080 Pure Pool Cue Billiard Chalk. Sold in tubes that contain five blocks of chalk each, the product has been touted by amateur and professional players alike for the improved accuracy it offers. The added friction it provides between the pool stick and the cue ball leads to greater consistency around the table; and the added spin you will get from this chalk will make you look like a master when setting up your next shot. Predator 1080 Pure Pool Cue Billiard Chalk offers a much longer on-tip chalk life than similar priced products while also providing better application and more complete coverage. The Predator 1080 Pure Pool Cue Billiard Chalk is the result of more than five years of research and three additional years of testing. It is made of a special formula that takes advantage of pure silica and a demanding development process to create the best chalk product possible. Made entirely in the U.S., the chalk makes a great gift for any pool player in the family who is serious about his or her game. Longer on-tip life. The silica formula in the Predator 1080 Pure Pool Cue Billiard Chalk helps it to stay on the tip longer than similarly priced products. Budget-friendly. This is by far the most budget-friendly product on our list—one that offers many of the same advantages of premium-priced chalks. No felt stains. Because the Predator 1080 Pure Pool Cue Billiard Chalk stays on the cue where it belongs, players will notice fewer blue felt stains. Available in blue only. Those who like to experiment with other colored chalks will have to look elsewhere. Needs more to fully chalk cue. The Predator 1080 Pure Pool Cue Billiard Chalk does not boast the fine particles of the previous two chalks and thus more is needed to completely cover the pool stick’s tip. To help you select the very best pool chalk for your needs and preferences, below we have covered some of the factors to consider before shopping for one of these products. However, first we will briefly explain the best way to use chalk on the tip of the cue stick. Before you can determine how much chalk your cue tip will need you will first need to consider the hardness of the tip. Harder cue tips last longer than soft-tipped cues, while the softer tips will hold more chalk and the chalk will remain on the tip longer, which means less regular chalking. When applying the chalk to the cue tip, you should always apply it evenly and with a light motion or touch, just as a woman applies lipstick to her lips. You will also need to ensure that ALL areas of the tip receive chalk—not just the most forward portion. Failing to apply a light, even layer of chalk to the cue tip can and will result in miscues and miss-hits. The WRONG way to apply chalk to a cue tip is to grind that chalk on the end of the stick. Not only will this cause the chalk to cake up in certain areas of the tip, it will also wear down the cue tip over time and thus shorten its lifespan. As we mentioned, hard cue tips will require more regularly chalking, perhaps after every two to three shots, while softer tips can go five or six shots before re-chalking. Always check your cue tip before taking a shot to ensure the tip is properly covered with chalk. One downside to regular chalking is the mess it can make—to the table, to the cue ball, and to the player. To avoid this, tap your cue lightly on the rail of the pool table after chalking. This will help remove any excess chalk before it has a chance to make a mess. Pool chalk is typically measured by fineness. Generally speaking, the finer the particles used to make the pool chalk, the better it will be. Fine chalk has the tendency to stay on the cue longer and it creates a greater level of friction between the pool stick and the cue ball. This friction can lead to better spin and greater accuracy on all of your shots. Keep in mind, however, that very fine chalk also tends to be more expensive than coarser chalk, so be sure to do your research until you find a product that meets both your expectations and your budget. The standard and most common color for pool chalk is blue. This is the color of chalk on almost all professional circuits—always has been and perhaps always will be. It is important to note, however, that you, as an amateur, are not limited to the blue color. After all, the only thing that makes most chalks blue is a dye they add towards the end of the manufacturing process. Therefore, if you are buying chalk for your own pool table, feel free to get creative, as pool chalk is available in colors like green, yellow, pink, orange and red, among others. Remember, the very best pool chalks are the ones with the finest particles. And the only thing that can compromise that fineness is moisture. Thus, when storing your pool cue chalk, try to keep it in a cool dry place that will not accumulate moisture. 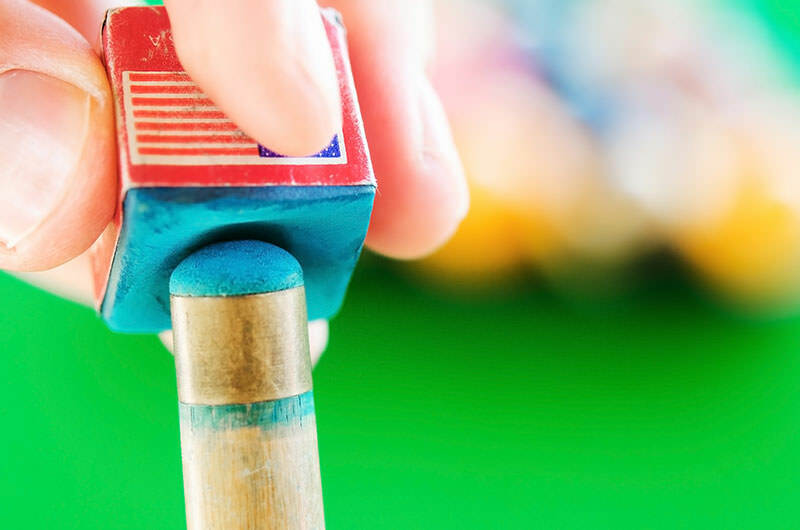 Failure to do so will result in the chalk clumping on your pool stick—which is never good. Lastly, let us talk a little about cleaning the pool chalk off your felt and pool balls. Even with the priciest pool chalk and your very best efforts to be clean, there will be times when chalk is transferred to the felt or the pool balls, especially the cue ball. To clean pool chalk and powder stains off the felt of the table you will need a pool table brush—a specially designed brush just for this purpose. When sweeping the table, sweep the chalk and other particles towards the holes on the pool tables so it has a place to escape. To clean chalk stains off your billiard balls you could benefit from a specialty pool ball cleaner which can be applied simply with a microfiber cloth. These cleaners not only remove the stains and grease from pool balls, but also return them to their natural shine and luster.